Taiwan Rural Front (TRF) and Taiwan Farmers Union (TFU), member of La Via Campesina in East and Southeast Asia, launch an emergency appeal for international solidarity against current administration’s rush for cross-strait free trade agreement and excessive use of police force. Pressure on the Ma administration has been mounting since the ruling Chinese Nationalist party (KMT) pushed to bypass full legislative review of the controversial Cross Straits Service Trade agreement (CSSTA) on March 17. Enraged by the politicking of the ruling party, nearly three hundred young Taiwanese stormed the legislature on March 18 and declared indefinite occupation of its main chamber. 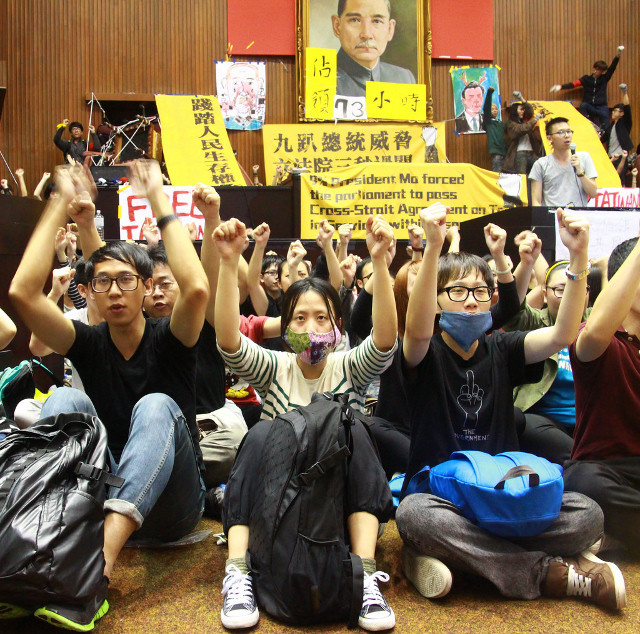 The occupy movement quickly gained momentum as over ten thousand Taiwanese flocked all sides of the legislature building in support of students’ cause. Represented by an alliance consisted of students, lawyers and civil organizations, the movement has since demanded that1) the CSSTA be retracted, 2) a formal monitoring mechanism for all cross-strait agreements be established, and 3) negotiations of any sort between Taiwan and China be halted before such monitoring mechanism exists. However, president Ma rejected all three demands on March 23 and ordered violent suppression of another group of protesters who had occupied the cabinet since March 22. Serious clash between police and protesters happened in the early hours of March 24. Launching 6 waves of attack in 5 hours, police first ordered journalists to leave and evicted those who had refused to leave by force. And besides firing high-pressured water cannon at peaceful protesters, riot police also swung batons at protesters and used their PVC shields to hit sitting students on the legs. Even members of the medical team were beaten up. Nearly two hundred protesters, including students and several TRF members, suffered injuries from violent beating, dragging and pushing. 61 people were arrested for trespassing. In light of the serious police crisis, Taiwan Peasants Union and Taiwan Rural Front urgently seek international solidarity from all members of Via Campesina, to join hands with us in rejecting free trade agreements and condemning police brutality and repression of people’s rights of assembly and speech by government of Taiwan. We insist that: First, international human rights standards require that in dispersing assemblies, police must avoid the use of force or, where that is not practicable, must restrict any such force to the minimum necessary. Any decision to disperse an assembly should therefore be taken only as a last resort and in line with the principles of necessity and proportionality. Police brutality against peaceful protestors shown on March 24 apparently breached such international protocol. Second, it has been proven that trade liberalization is the direct cause of the widening gap between the rich and the poor in Taiwan. Ma administration repeatedly claims that South Korean people welcomed and have benefited from the Korea-U.S. FTA (KORUS FTA). But our sisters and brothers from KWPA and KPL taught us otherwise: KORUS FTA does not simply lower or eliminate tariffs; it is also an unfair trade pact with toxic provisions. Free Trade Agreement is unfair trade, and joining CSSTA will only push 99% of Taiwanese further into the neoliberal international trade regime, which is a race to the bottom in prices, wages, and environmental degradation. We demand that Taiwan government to take immediately action to stop all free trade negotiations and agreements that are harmful to farmers, consumers, and the environment! For solidarity message please sent to: nikar2009@gmail.com your message will translate and inspire our struggle in Taiwan.